Cancer is caused by nanobacteria or viruses which look to the mutation rate of a particular gene to tell them which host to destroy. Then they don't destroy all of their hosts, only one in a few thousand. For thirty years I've been researching the evolution of the morel mushroom. What I can tell you about evolution is that it would not have allowed cancer to be maintained in the genome of the host, as assumed. Evolution is very effective in removing detrimental effects from the genetic material of a species (genome). Cancer is way too detrimental, and has been around way too long, to have escaped the effects of evolution. Evolution must always result in improvements in the survivability of a species, because the less fit types do not survive as well as the more fit types. Cancer makes a species less fit, and therefore, cancer should have disappeared. But if cancer were controlled by a disease causing microbe, then that microbe would be more fit for survival as it acquired greater ability to create cancer. In other words, any significantly developed disease can only survive evolution when it is caused by a microbe that can benefit from the evolution of the disease. This means cancer is not in the genome of the host but in the genome of microorganisms. In other words, microorganisms, such as a virus, spiroplasma, mycoplasma or other nanobacteria, must cause cancer. If a virus is the cause, not much is gained by knowing so. Viruses are more difficult to treat than cancer. But if a spiroplasma or mycoplasma is the cause, an antibiotic should be beneficial. Antibiotics are used successfully to treat the mycoplasma of "Gulf War Illness" by Garth Nicholson. It would not be surprising for cancer scientists to overlook these points. Just a few years ago, scientists were surprised to find that ulcers can be treated with antibiotics, and the cause is a great big, easy to see, bacterium. Spiroplasma appears to be the cause of the so-called prion diseases, while a protein is usually assumed to be the cause. Spiroplasma and mycoplasma are very difficult to observe, because they lack a cell wall and blend into the host cell structure. Old antibiotics, such as penecillin, were not effective against mycoplasma. Since newer antibiotics were available, they probably have not been tested seriously enough, if at all, to determine their effectiveness against cancer. Certainly, environmental effects, particularly toxic chemicals, "cause" cancer. Some persons therefore assume that a microbe is not involved. However, all diseases are greatly affected by environmental conditions. Environmental conditions create the predisposition for disease. Genetic state can also create a predisposition for cancer. But predisposition is not cause. Consider some of the scientific logic about mycoplasmas. They are commonly found in the bodies of all persons, but they usually do not appear to have any detrimental effects. 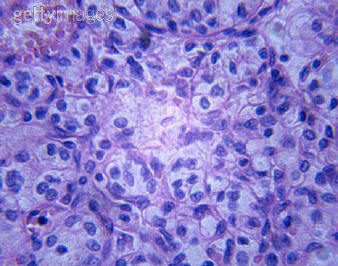 A likely reason is that they wait for the host cells to be weakened or damaged, and then they take over the physiology. Cancer would give the causative agent (pathogen) the advantage of drastic take-over of the host's physiology; but since it is localized in a few cells, it would delay the death of the host thereby giving the pathogen more time to multiply. This mechanism would explain the biology of both mycoplasmas or other nanobacteria and cancer. One of the assumptions that tends to lead scientists astray is that mutations appear to be the cause of most cancers. There is a very obvious logic to the correlation with mutations. Mutation rates create a very good method for a microbe to selectively attack the host. By using a specific mutation as a trigger for a microbe to create cancerous growth, a single host individual can be totally destroyed, while the rest of the population remains healthy and provides a pool of additional hosts. The percent of the population which is attacked can be controlled by picking a mutation which has that particular prevalence in the population. The bacteria which do this must be able to lie dormant and invisible to the immune system for any amount of time. Nanobacteria have this property. For the same reason that they are invisible to the immune system, they are nearly undetectable by science. But modern techniques are capable of detecting them, and more work needs to be directed toward this purpose. NCI: http://www.cancer.gov and the SEER Homepage: http://www.seer.cancer.gov. Click on the icon "1975-2001 Report to the Nation."